Marbled Murrelet, from a boat off Newport, Oregon on 21 February, 2009 by Greg Gillson. 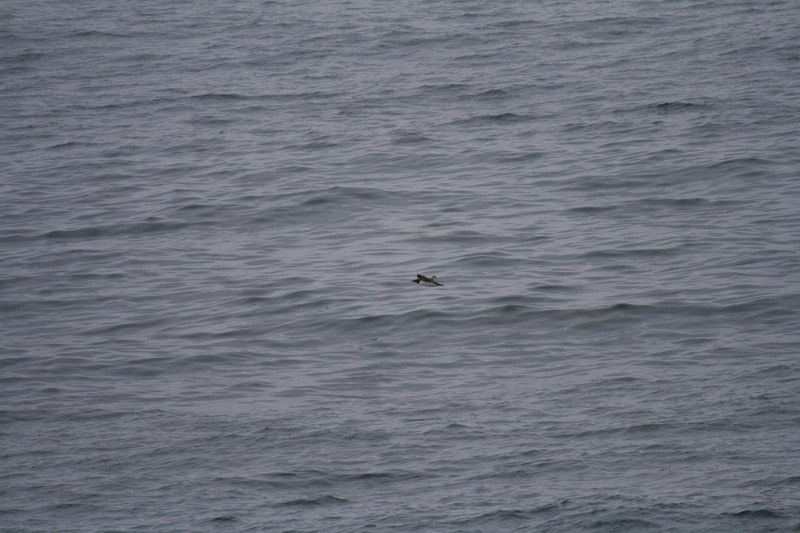 Last week's post discussed a seawatch--viewing seabirds from shore. 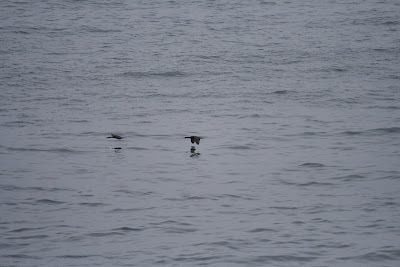 In it, I showed views of seabirds as they would appear using binoculars and spotting scopes. 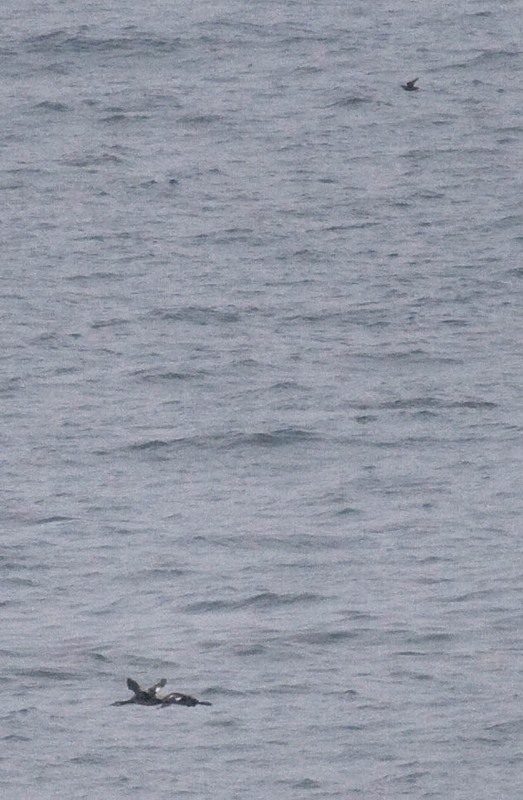 In last week's post we "magnified" a pair of Red-necked Grebes about a half mile offshore. In the magnified view--a view as would be seen with a spotting scope--we discovered another small speck of a bird that I identified as a Marbled Murrelet in flight. 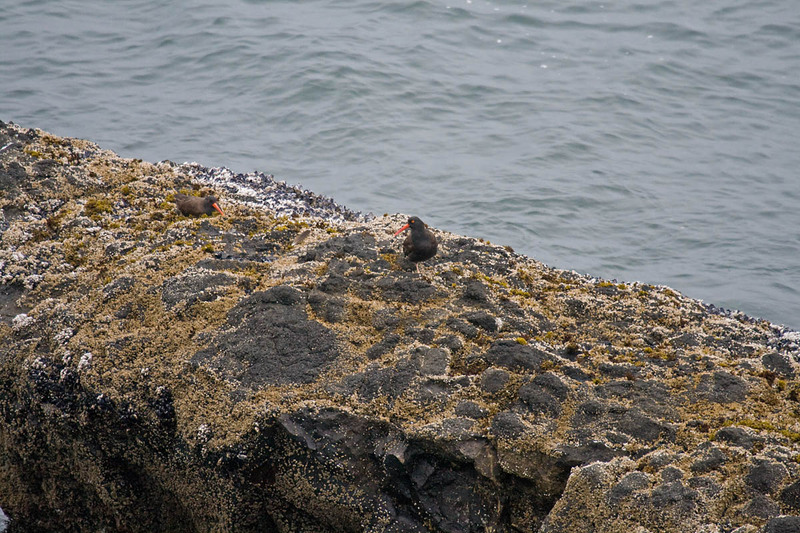 Over time, a dedicated seawatcher may see many of the Pacific Northwest's oceanic birds. However, many seabirds would be just specks--even with a spotting scope. Without closer-range experience, one would not be able to learn the distinctive flight characteristics that would help identify some birds. And many seabirds rarely come near land off the Pacific NW. The only way to see these birds better, in the Pacific Northwest, is to board a boat. Boats do present some logistic challenges: route, instability, expense, and mal de mar (seasickness). Unless you own your own seaworthy craft, the only way to get the boat to go bird watching is to charter it. Chartering a vessel in the Pacific NW may cost $750 for a small boat ("six-pack," which carries 6 persons on a 20-30 foot boat) or a larger Coast Guard certified vessel that may carry 20-30 passengers on a boat 40-55 feet long for a rate of about $2500 per day. Sharing the cost among the participants is a way to make such a trip affordable--but usually can't be done on the spur of the moment. In the Pacific Northwest, the only two regular providers of seabirds watching trips by boat, or "pelagic trips," are Westport Seabirds in Washington State and The Bird Guide in Oregon. Shearwater Journeys operates out of California (primarily Monterey area) with some trips in northern California. There are a couple other providers (often Audubon Societies and dedicated individuals) that offer pelagic trips from Monterey south to San Diego. Only the larger boats are Coast Guard certified to travel beyond 20 miles of shore--out to the albatrosses and several other more oceanic species. 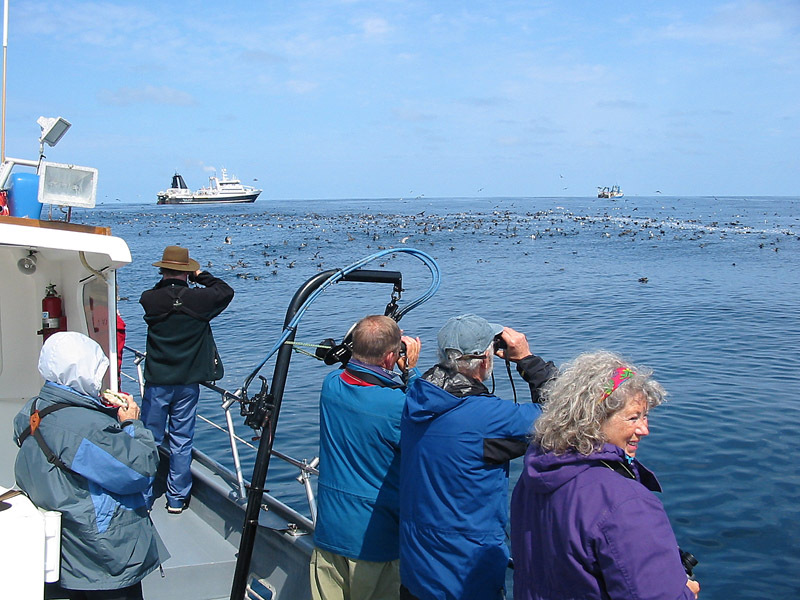 Thus, a dedicated group pelagic trip on a large boat is the most direct way for an individual to view seabirds. A full-day trip may cost $150 per person. On such a trip, many birds will still be distant. But unlike on a land-based seawatch, you can get closer with the boat. A chartered pelagic birding trip is designed to go where the birds are. During the day, chances are good that you will see thousands of seabirds, many at very close range. On your first such trip you are likely to add 15-20 life birds--species you've never seen before! 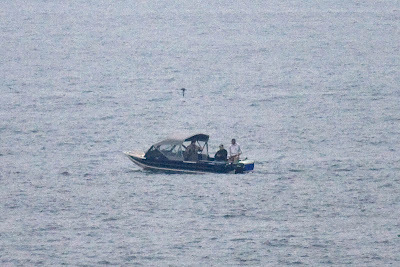 Because the boat bobs on the waves, a birder on a regular pelagic trip cannot use a scope and tripod--binoculars are required. Of course, bobbing up and down looking through binoculars is not easy on your equilibrium, leading to queasiness (or worse) for some people. Despite these challenges, a pelagic trip is the best way to see seabirds. They are timed for the best birding and led by expert seabird guides intent on showing you seabirds and helping you to identify them. Happy birders encounter fishing vessels trailing thousands of seabirds (albatrosses, shearwaters, fulmars, jaegers, petrels, and other birds, not to mention whales and dolphins!) on a pelagic trip off Newport, Oregon on 31 May 2003 by Greg Gillson. There are a few options besides a scheduled pelagic trip. These options are less certain than a pelagic trip--you may not see any birds worth mentioning. Or worse--you see lots of birds just a few hundred feet away but the boat won't travel toward them so you can identify them, because... it is not a birding trip. More important, you'll often have to identify the birds yourself. 1) Whale watching trip: From certain ports on the West Coast, specifically at Newport and Depoe Bay on the central Oregon coast, local fishing charters lead out trips to view Gray Whales at $20 per person. These trips will often be right along shore, though in winter they may go out 5 miles. These trips last an hour or two. Gray Whales and Marbled Murrelets feed on the sandy bottom and are often seen together. You might see a Rhinoceros Auklet, Tufted Puffin, or Northern Fulmar. You may see nothing, not even a whale. 2) Bottom or salmon fishing trip: "Deep sea fishing" is not done in the deep sea. Boats rarely go out more than 3 miles for bottom fishing, often less than one mile to "inner reefs." However, if you want to join fishing friends for 4 hours, you can often get a 1/2 fare for non-fishing passenger, or about $35. These won't see any more than on a whale watch trip, but are offered from more ports. Expect lots of cormorants, murres, and Pigeon Guillemots, and probably some Marbled Murrelets and maybe some other nearshore pelagic birds and harbor porpoises. 3) Halibut or tuna fishing trip: These trips go out 20-40 miles and take you into albatross waters. However, once there you are likely either to sit in one place or troll round and round in a small area. These trips are 12-18 hours, cost about $350 per person, and usually do not allow non-fishing passengers. If you like to fish, this can be a great trip. However, there may be hours at a time with no birds whatsoever. The best birds are often seen on the trip out and back, which may be at dawn and dusk. Halibut trips such as these are offered only May and August. The tuna trips are July to early September. 4) Cruise ship repositioning trips: Lasting 3-4 days, these trips on luxury ocean liners are surprisingly affordable ($200). They travel out at 60 miles, beyond large numbers of birds, including albatrosses--out where any bird could be a mega-rare petrel or other seabird. Great whales are often spotted. A 3-day cruise will cost you far less than 3 regular one-day pelagic trips (especially if you include travel, motel, and food for 3 days). You'll have to come up with a bus ($75) or rental car from Vancouver, British Columbia and a flight from either San Francisco ($170) or Long Beach, California. So, maybe $550 per person (from Portland, Oregon), double-occupancy, in a lower-class room. Advantages of a cruise ship include a bed if you get tired, food is included in the price, and you can set up your spotting scope on the deck. You usually bird from a covered deck on about the 7th floor of the bow. In many ways, this is like a seawatch. For the past several years small groups of birders have been arranging these trips--so you may find a trip with other expert seabirders to help spot and identify birds. This post is co-published on the Pacific NW Birder blog. What are these people doing? 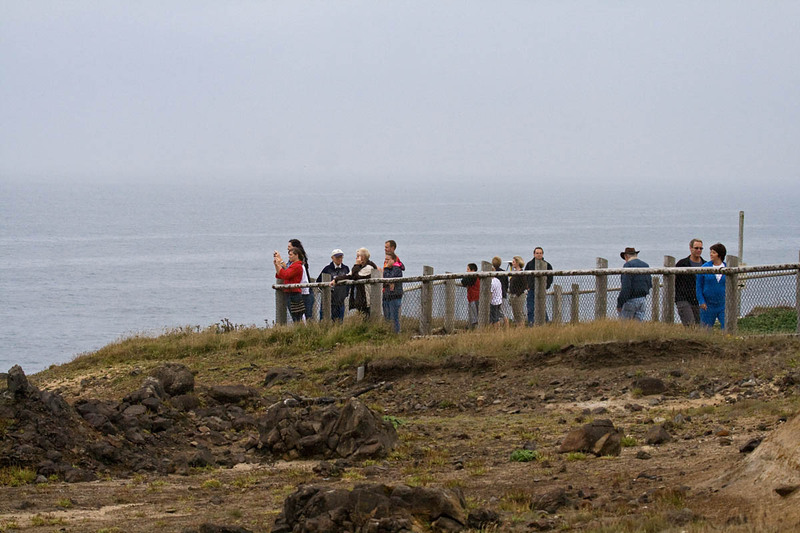 Looking for Gray Whales at Boiler Bay State Wayside near Depoe Bay, Oregon! Good viewpoints for whales are positioned not too far above or away from the water. Not surprisingly, good places to view Gray Whales are also good places to view nearshore seabirds. And Boiler Bay is perhaps the best seawatch site on the West Coast. But if you don't know what to expect, you may be disappointed. Time spent scanning for seabirds is called a "seawatch." Seawatches are not very successful with only binoculars. It usually requires a higher-powered (20-60x) spotting scope to bring the birds closer into view. 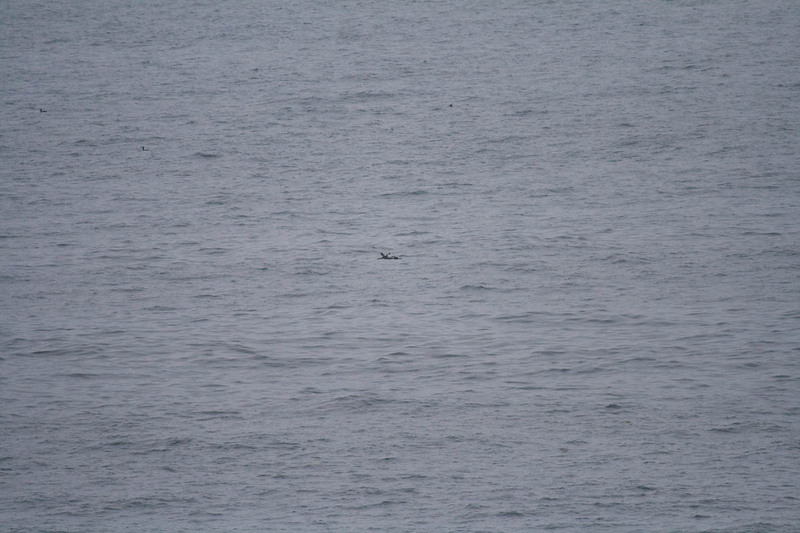 In fact, the photos presented here are all designed to show you what you would actually see with binoculars or a spotting scope on a seawatch. I took these photos in August 2009, just to see how bad photos of seabirds from shore would be (in general, bad, just as I surmised). Not magazine quality, are they? But they prove useful in teaching about seawatches. Just beyond the first breakers you may see cormorants. In the photo below, a Pelagic Cormorant leads a Brandt's Cormorant. Click for a view such as you would see with binoculars. 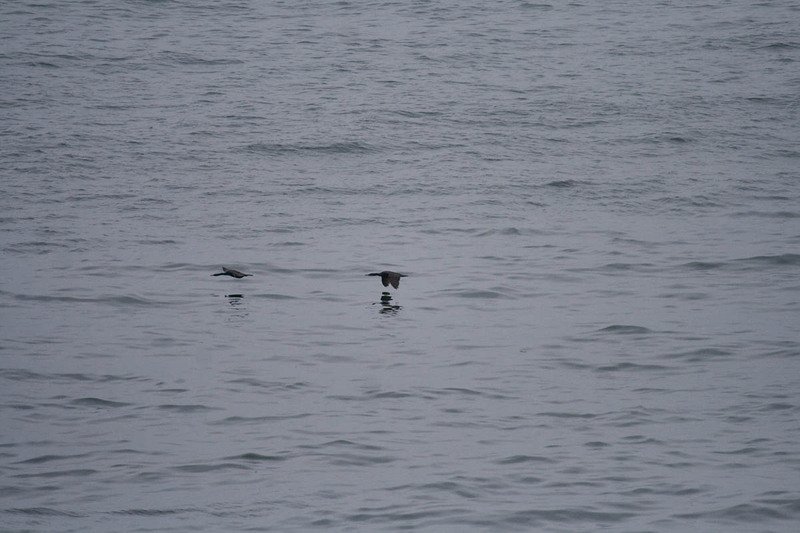 You may also see Common Murres quite near shore. Such as in the photo below. Again, click to view the photo as it would appear with binoculars. 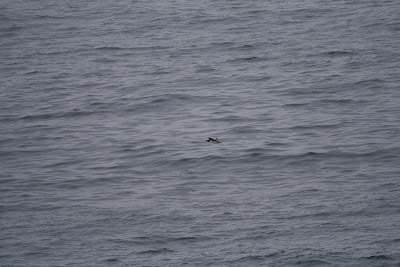 And here is a photo of a Pigeon Guillemot out about 1/4 mile. Click on the photo to make it appear as you would see it in binoculars. 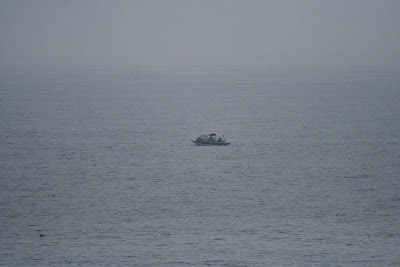 On a seawatch, most of the birds are quite distant and views are usually no where near "field guide quality." It takes practice to identify seabirds and to learn what field marks you can see at a distance. By watching nearer, known-identity, birds fly away, you can learn flight shape and characteristics that will allow you to put a name on more distant birds. Your binoculars aren't much use for birds more than a half mile distant. But with a spotting scope, you can identify birds 3 miles at sea or more. 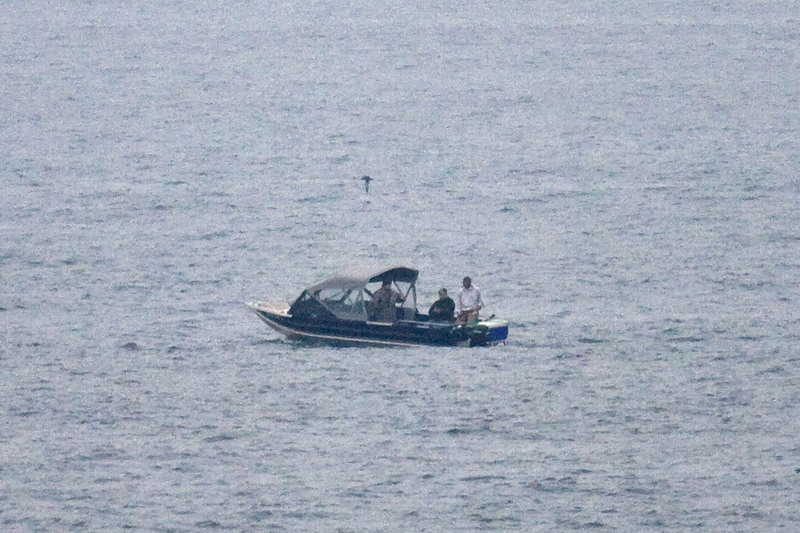 For instance, take a look at this fishing boat about a mile offshore. Click the photo to give you a fairly accurate view of what you would see with binoculars. Do you see the bird just behind the boat? 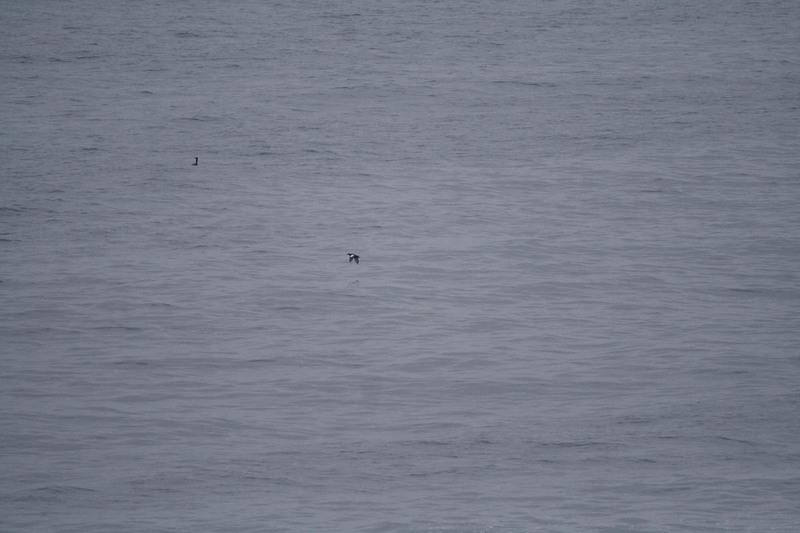 If you watch the flap-and-glide progression of this long-winged bird, you could guess it was a shearwater. However, you need more optical magnification. So, click on the following photo to see what you might see with a 25x spotting scope. You can see the long-winged bird flying right-to-left. The left wing is pointed right at us, so we can't see it. What we see is the underside of the right wing. 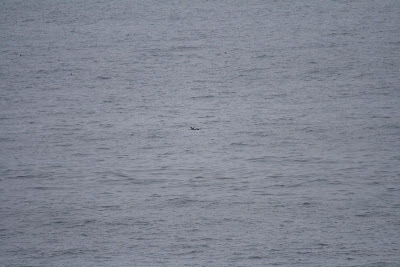 The white underwing linings are clearly seen, identifying this bird as a Sooty Shearwater! 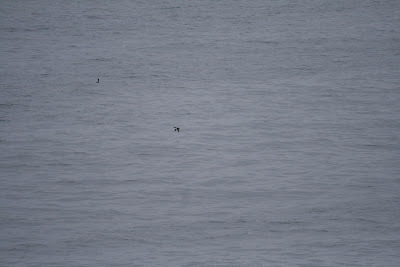 Here is another photo of a pair of Red-necked Grebes flying south about 1/2 mile out. Click the photo to see what view you would have of these birds with binoculars only. Oh, that speck would be hard to identify with binoculars only, wouldn't it? A lot of time on a seawatch is spent scanning with binoculars, then switching to the more powerful scope when you find something. Scanning with the scope has too small of a field of view--you'll miss more birds than you'll find if you scan with your scope. So find the birds with your bare eyes or with binoculars, then switch to higher power. For instance, once you spot those flying "specks" in the above photo, get on it with your scope and you'll see something interesting. Click on the photo below to see what you would see with a spotting scope. Now you can see the white face and white secondary wing patch identifying the two Red-necked Grebes in the lower left of the photo. But notice what else appeared in our virtual spotting scope view? In the upper right of the photo is a bird flying left with pointed wings bent sharply at the wrist. The throat is pale and the head appears slightly raised on a short neck. Can you make it out? 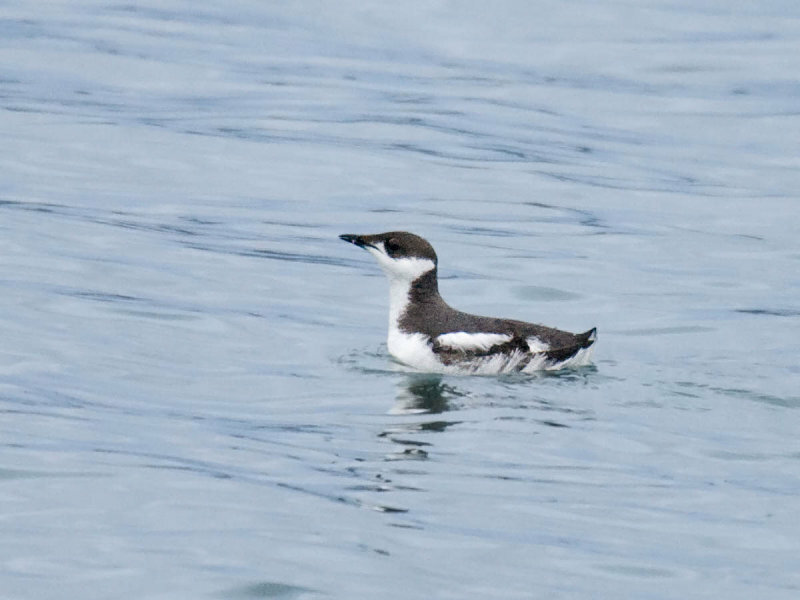 That's a Marbled Murrelet. So, to answer your question... yes, seawatchers identify distant birds with only minimal pattern, shape, and flight style clues. Even with spotting scopes the views are not very good. But scopes do allow you to see small specks of birds about 3 miles offshore or farther, depending upon atmospheric conditions. Here are some hints to make seawatching more successful. 1) Go at dawn. Seabirds are nearer shore first thing in the morning, then move off. By 2 hours after sunrise activity may be mostly over for the day. In May, that could mean that all the action is over by 8 a.m. On the West Coast, the sun comes up behind you, giving you the best light at dawn. 2) Scan with your naked eye or with binoculars. Only when you find something do you switch to your spotting scope. 3) Go seawatching during spring and fall migration, April-May and September-November. 4) Go during really nasty weather. Those big November windstorms often push seabirds near shore. Go between downpours. Dress warmly. Protect your optics. Head for a hot bowl of chowder afterward. 5) Practice, practice, practice! Identify close seabirds, then watch them as they fly away. What do you see as they get farther and farther away? Learn seabird patterns, shapes, and flight styles. Andy Frank took some photos of Ancient Murrelets at Boiler Bay in December. 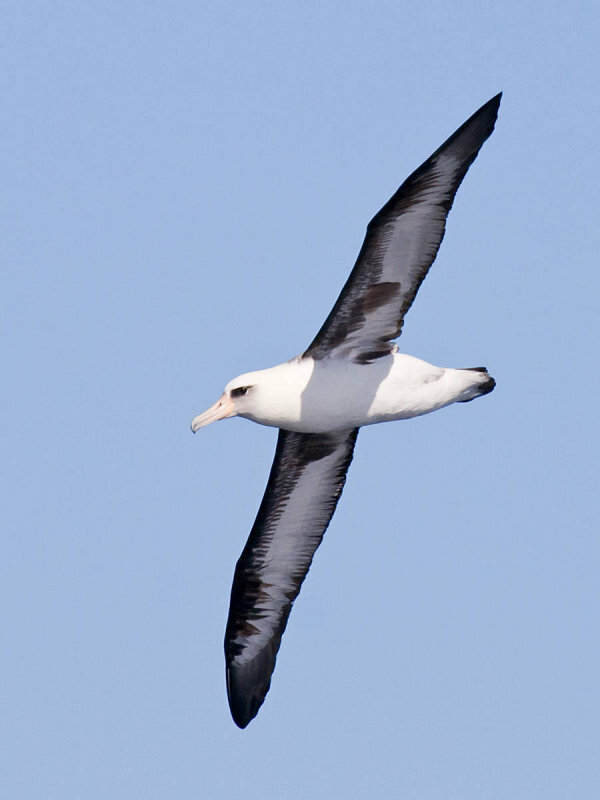 The Bird Guide's annual Laysan Albatross search trip is scheduled for Saturday, March 12, 2011. This first trip of the year is designed to get our pelagic season off to an exciting beginning. Besides these wonderful albatrosses, frequent birds include Ancient Murrelets, Short-tailed Shearwaters, Thayer's Gulls, and high numbers of Rhinoceros Auklets and Black-legged Kittiwakes! 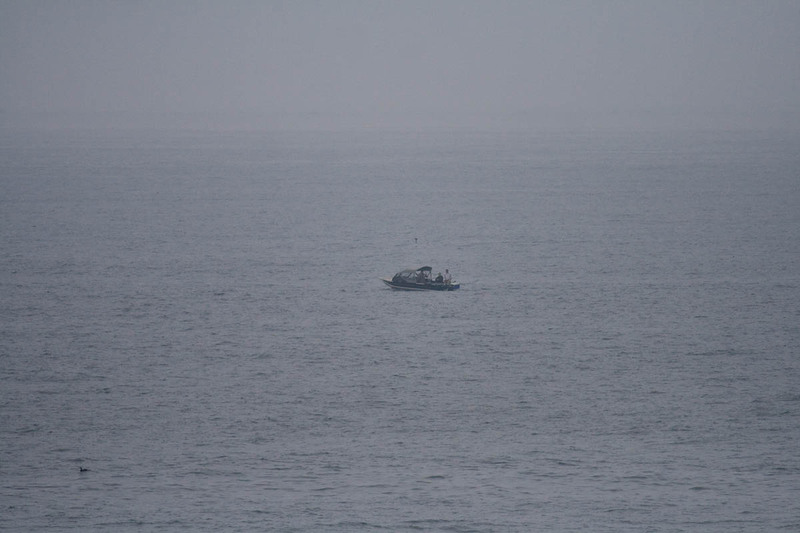 As of January 31, 2011, the boat is about half-full--there are still about 15 spaces open. This trip will be sold out soon! This 10-hour trip costs $150 per person from Newport, Oregon. Check on The Bird Guide's pelagic web pages for more information. See last year's trip results.